One of my favorite ways to take notes is with Foldable Notes. This is an easy way to get students to create their own notes and develop the Math concepts in their own writing. I have two NO PREP Foldable Note sets for 7th grade Geometry that cover ALL common core standards. These are easy to print and go! You can use a scaffolded approach or just print for absent students. It's a great alternative to traditional note taking!! 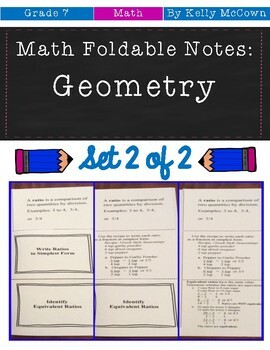 These math foldable notes are for students to be able to apply and extend understandings of geometric shapes with given conditions, use facts about supplementary, complementary, vertical, and adjacent angles in a multi-step problem to write and solve simple equations for an unknown angle in a figure, and solve real-world and mathematical problems involving triangles, quadrilaterals, and polygons. These math foldable notes are for students to be able to apply and extend understandings of solving problems of geometric figures, drawing geometric shapes and finding missing measures, describing two-dimensional figures, knowing the formulas for the area and circumference of a circle, and solving real-world problems involving area, volume, and surface area of two- and three- dimensional objects.